A superb commemorative gift for the birth of a new child. 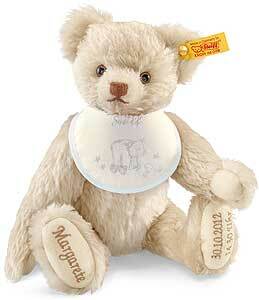 The Steiff Personalised Birth Teddy Bear with blue bib, embroidered with the child's Name and the date of the wonderful occasion. Made from the finest cream mohair, fully jointed, size 27cm. Comes boxed. Note: This is a collectors item and not a toy. PLEASE ALLOW 6 to 8 WEEKS DELIVERY!